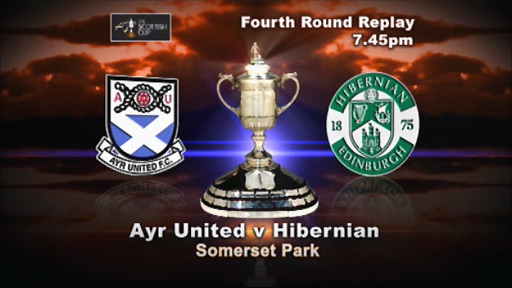 Mark Roberts was the goal hero as Ayr United dumped hapless Hibernian out of the Scottish Cup at Somerset Park. Roberts danced one way then the other before planting a composed shot into the bottom corner on 19 minutes. The Second Division side had David Crawford to thank for first-half saves from John Rankin and Kevin McBride. Crawford got fingertips to a curling Derek Riordan strike and kept out a Colin Nish header, while Paul Hanlon and Liam Miller went close for Hibs. The fourth round replay ended with a small band of delirious home fans on the pitch celebrating with United's part-time players. And having more than matched Hibs over two games, Brian Reid's side will go into the next round believing they can upset St Mirren. For the visiting supporters it was a night of misery in what has been an awful campaign. Manager Colin Calderwood has won just two of the 14 games he has overseen since replacing John Hughes in late October, with this reverse surely the nadir of his tenure. Calderwood has repeatedly chopped and changed the team and opted for an experienced line-up on a wet night in Ayrshire. The visitors did forge several chances to get a foothold in the match but Crawford was in fine form, while his United team-mates put in a shift full of commitment. The all important breakthrough came when Hibs were caught on the break following a long spell of possession. Andy Rodgers returned the ball to Roberts who took it down just inside the box, but there appeared to be limited danger as Ian Murray and Hanlon blocked his way to goal. However, the 35-year-old striker moved the ball from foot to foot until he had time and space to shoot, and smartly guided the ball into the bottom corner. Hibs had an instant chance to level when Darryl Duffy's pass found Rankin, who charged into the area unchallenged but saw his shot blocked by the foot of Crawford. The hosts were later caught square and McBride burst towards goal with Crawford rooted to his line. But the Ayr goalkeeper parried the midfielder's angled effort and the home defence blocked Riordan's follow-up. The underdogs started the second half brightly but right-back Jonathan Tiffoney almost gifted Hibs a 57th-minute equaliser when he tried and failed to take the ball round Riordan inside the box after Nish had won a long free-kick in the air. Riordan immediately curled the ball towards the far corner but Crawford threw himself to his left to push wide. Ayr soon had another narrow escape when Tiffoney nodded Hanlon's header off the line following a corner. Ayr responded and both Roberts and Rodgers came close to converting Tiffoney's low cross that was spilled by nervous Hibs keeper Graeme Smith. Liam Miller saw a shot deflected fly narrowly wide after a lay-off from Nish, whose header from the resulting corner was pushed wide by the diving Crawford. But Hibs ran out of steam and failed to keep up the pressure, with Brown almost spilling Scott McLaughlin's free-kick at the other end. The home were pressed back in the final 10 minutes as Crawford held Riordan's powerful strike and David Wotherspoon twice fired wide from inside the penalty box. However, there were no further scares as Ayr clinched the biggest upset of this year's contest so far. 90:00+3:16 The match has reached full-time. 89:41 Substitution Ross Robertson on for Mark Roberts. 87:48 Liam Miller has an effort at goal from just outside the box which goes wide of the right-hand upright. 87:14 Shot by Kevin McBride from 20 yards. Ebbie Malone gets a block in. 86:44 Corner from right by-line taken by Merouane Zemmama. 85:35 Effort on goal by Chris Smith from long range goes harmlessly over the target. 84:24 Drilled left-footed shot by Derek Riordan. Save made by David Crawford. 83:19 David Wotherspoon has an effort at goal. Blocked by Ebbie Malone. Corner taken by Merouane Zemmama. 80:37 Headed effort from inside the area by Liam Miller misses to the right of the goal. 79:27 A cross is delivered by David Wotherspoon, John Rankin produces a header from deep inside the six-yard box that clears the crossbar. 79:27 Substitution Callum Booth replaces Paul Hanlon. 76:57 Derek Riordan is flagged offside by the assistant referee. Free kick taken by David Crawford. 76:06 Scott McLaughlin takes the inswinging corner, Merouane Zemmama manages to make a clearance. 74:59 John Rankin concedes a free kick for a foul on Andy Rodgers. Scott McLaughlin produces a shot on goal direct from the free kick, save by Graeme Smith. 72:28 Unfair challenge on Ryan McCann by John Rankin results in a free kick. Direct free kick taken by David Crawford. 70:48 Stuart Bannigan fouled by Liam Miller, the ref awards a free kick. Ebbie Malone restarts play with the free kick. 69:51 Unfair challenge on Jonathan Tiffoney by John Rankin results in a free kick. Scott McLaughlin crosses the ball from the free kick left-footed from right wing. 66:55 Paul Hanlon takes a shot. Corner taken by Merouane Zemmama, Derek Riordan takes a shot. Save by David Crawford. Corner from the right by-line taken by Merouane Zemmama, Liam Miller takes a shot. Corner from the left by-line taken by John Rankin, Headed effort from deep inside the area by Francis Dickoh misses to the left of the goal. Save by David Crawford. Ebbie Malone gets a block in. 66:55 Substitution David Wotherspoon replaces Michael Hart. 63:37 Substitution Merouane Zemmama replaces Darryl Duffy. 62:34 Ryan McCann takes a shot. Save by Graeme Smith. 62:22 The ball is swung over by Jonathan Tiffoney, Graeme Smith makes a save. 61:20 Paul Hanlon gives away a free kick for an unfair challenge on Andy Rodgers. Free kick taken by Scott McLaughlin. 57:17 John Rankin takes the outswinging corner, Colin Nish takes a shot. Clearance by Jonathan Tiffoney. Correction - 56:19 Derek Riordan takes a shot. Save by David Crawford. Corner from the right by-line taken by John Rankin, Paul Hanlon has a headed effort at goal from deep inside the area missing to the left of the target. 56:19 John Rankin takes a shot. Save made by David Crawford. Inswinging corner taken by John Rankin, Paul Hanlon has a headed effort at goal from deep inside the area missing to the left of the target. 55:51 Free kick awarded for a foul by Chris Smith on Kevin McBride. Michael Hart restarts play with the free kick. 54:51 Free kick awarded for an unfair challenge on Mark Roberts by Liam Miller. Direct free kick taken by Scott McLaughlin. 53:57 The official flags Mark Roberts offside. Graeme Smith takes the indirect free kick. 53:28 Colin Nish challenges Chris Smith unfairly and gives away a free kick. Free kick taken by David Crawford. 48:30 Derek Riordan concedes a free kick for a foul on Ryan McCann. Scott McLaughlin delivers the ball from the free kick left-footed from right wing, Graeme Smith makes a comfortable save. Correction - 47:55 Liam Miller gives away a free kick for an unfair challenge on Stuart Bannigan. Free kick taken by Scott McLaughlin. 47:55 Liam Miller concedes a free kick for a foul on Stuart Bannigan. Free kick taken by Scott McLaughlin. 45:45 A cross is delivered by Kevin McBride. 45:00+1:17 The first half comes to an end. 45:00 John Rankin takes a inswinging corner from the right by-line played to the near post, clearance made by Chris Smith. 43:54 A cross is delivered by Michael Hart, clearance by Ebbie Malone. 42:09 Scott McLaughlin takes a shot. Graeme Smith makes a save. 41:19 Free kick awarded for an unfair challenge on Martyn Campbell by Colin Nish. Scott McLaughlin restarts play with the free kick. 39:17 Kevin McBride takes a shot. Save made by David Crawford. Colin Nish takes a shot. Blocked by Chris Smith. Free kick awarded for an unfair challenge on Stuart Bannigan by John Rankin. Scott McLaughlin takes the free kick. The offside flag is raised against Mark Roberts. Graeme Smith takes the indirect free kick. 35:40 William Easton takes a shot. Save made by Graeme Smith. Scott McLaughlin takes the inswinging corner, Chris Smith has a headed effort at goal from close range which goes wide left of the target. Free kick awarded for a foul by Darryl Duffy on Martyn Campbell. Scott McLaughlin takes the direct free kick. The offside flag is raised against Mark Roberts. Graeme Smith takes the free kick. 30:34 The official flags Mark Roberts offside. Graeme Smith restarts play with the free kick. 29:00 Free kick awarded for a foul by John Rankin on Mark Roberts. Free kick taken by Stuart Bannigan. 27:44 The ball is crossed by Derek Riordan. 25:12 Unfair challenge on Andy Rodgers by John Rankin results in a free kick. Scott McLaughlin takes the free kick. 24:21 Martyn Campbell gives away a free kick for an unfair challenge on Darryl Duffy. John Rankin takes the direct free kick. 23:20 John Rankin takes a shot. Save by David Crawford. Inswinging corner taken by John Rankin from the left by-line, Headed effort from deep inside the area by Paul Hanlon misses to the left of the goal. 22:40 Colin Nish takes a shot. David Crawford makes a comfortable save. 19:52 Corner taken right-footed by Derek Riordan to the near post, Jonathan Tiffoney makes a clearance. 18:50 Assist on the goal came from Ryan McCann. 18:50 GOAL - Mark Roberts:Ayr 1 - 0 Hibernian Mark Roberts scores a goal from deep inside the penalty area to the bottom left corner of the goal. Ayr 1-0 Hibernian. 16:38 Chris Smith crosses the ball. 13:39 Jonathan Tiffoney gives away a free kick for an unfair challenge on John Rankin. Paul Hanlon takes the free kick. Foul by Colin Nish on David Crawford, free kick awarded. Free kick taken by David Crawford. 13:21 The ball is swung over by Michael Hart, comfortable save by David Crawford. 9:04 Kevin McBride takes a shot. Chris Smith makes a clearance. 8:07 Mark Roberts gives away a free kick for an unfair challenge on Kevin McBride. Michael Hart takes the free kick. 6:17 Chris Smith takes a shot from close range clearing the crossbar. 5:42 Corner taken left-footed by Scott McLaughlin, Graeme Smith makes a save. 3:50 Colin Nish concedes a free kick for a foul on Martyn Campbell. Direct free kick taken by Jonathan Tiffoney. 1:17 Derek Riordan produces a right-footed shot from just outside the penalty box that misses to the left of the target.